We are very serious about our love of poetry in this town - so much so that, for five years running, Northfield’s Arts and Culture Commission has chosen local poets’ works to be installed in concrete. 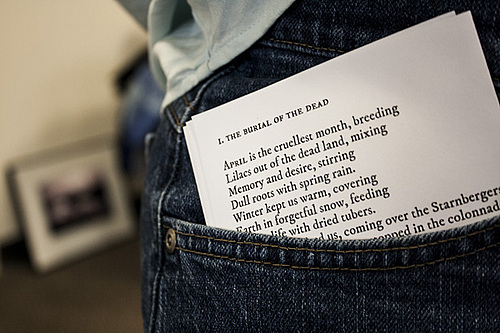 In further demonstration of our community’s love of poetry, this week marks the third year of Northfield’s participation in the national Poem in Your Pocket Day, as established by the Academy of American Poets. In twelve locations, Northfielders will have the opportunity to select poems to take with them for sharing with others - friends, family, co-workers and even strangers. Included in the boxes are not only poems penned by the winning poets in Northfield’s Sidewalk Poetry Competition, but those of well-known poets of long ago, as well. In 2002, as part of New York City’s National Poetry Month celebration, the Office of Mayor Bloomberg, in partnership with the New York City Departments of Cultural Affairs and Education, initiated Poem in Your Pocket (PIYP) Day. New Yorkers were encouraged to select a poem, carry it with them, and share it with others throughout the day. The Academy of American Poets, in 2008, brought the program to the nation’s attention, encouraging communities across the country to join in the celebration and appreciation of poetry. Twelve red boxes of poetry will be placed in Northfield businesses from Thursday, March 30th through Sunday, May 3rd. The Arts and Culture Commission encourages citizens to select poems and enthusiastically share them with others, perhaps even taking time to read them aloud.